Both the Google Nexus 6 and Samsung Galaxy Note 4 have received significant media and consumer attention, but they’re similar enough that many users may not be sure which one best meets their needs. As a result, it’s time for a phablet-to-phablet showdown: Who comes out on top in the battle of the Nexus 6 versus Galaxy 4? First off, both of these phablets are massive. PC Advisor reports that the Nexus 6 comes in slightly taller, wider and thicker at 160 mm by 83 mm by 10.1 mm, while the Note 4 offers 154 mm by 79 mm by 8.5 mm for those who want a more smartphone-like experience. Both are almost the same weight (184 and 176 grams, respectively), use AMOLED screens and have a Snapdragon 805 quad-core 2.7 Ghz under the hood. In many respects, they’re separated only by branding and small details. Depending on how you use your phablet, small things could make a big difference. As reported by PC Advisor, one notable difference between the two devices is how touch sensitivity is achieved. On the Nexus 6, touch capability is added as another layer on top of the AMOLED screen, while Samsung’s SuperAMOLED version has touch sensitivity built right in. This results in a Note screen that shows fewer reflections and “seems more immersive.” The cameras are also similar: Google includes 13 MP rear-facing and 2.1 MP front-facing cameras on the Nexus, while Samsung users get 16 MP rear and 3.7 MP front clickers. On paper this means a win for the Galaxy, but it’s worth noting that the Nexus includes a dual-LED flash and the Note does not, which can help improve photo quality in dark or dimly lit situations. Gizmag points out that the Galaxy Note 4 comes with several quality-of-life features that are missing in the Nexus, including a fingerprint sensor, heart rate sensor, split-screen multitasking and one-handed mode. The Note also offers Samsung’s patented stylus, which allows you to easily take notes, save images or annotate screenshots. While it’s not the most important feature of a phablet, the stylus isn’t just window dressing, either. Google wins the Nexus 6 versus Galaxy 4 pricing battle, coming in around $50 cheaper for both full retail price and on-contract plans. The Nexus also includes Lollipop while most Galaxy phablets still come preloaded with Android KitKat. The Samsung TouchWiz user interface largely dominates the user experience, so if you’re not a fan of Samsung’s user feature set, then Galaxy might just get in your way. According to a recent Phone Arena article, Samsung has big plans for the Note 4, starting in South Korea. The manufacturer is on track to release a new version of the phablet powered by its own Exynos 5433 chipset. Samsung promises Cat. 9 LTE support, tri-band carrier aggregation, and download speeds up to a whopping 450 Mpbs on the new iteration. Again, the rollout starts solely in South Korea, but this is promising news for Galaxy fans worldwide. So who wins the Nexus 6 versus Galaxy 4 throwdown? 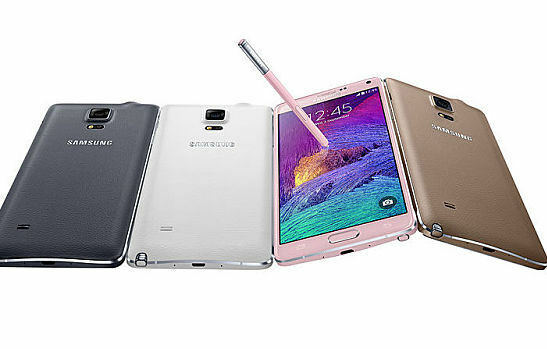 In terms of sheer specs and long-term viability, the nod goes to Samsung. It is worth pointing out that the Note 4 is more expensive and the user experience much more “curated” than on Google’s phablet, so if you’re looking for more of a blank slate, then the Nexus 6 may be your best bet. Have you used the Nexus or Galaxy? Share your thoughts with us below.